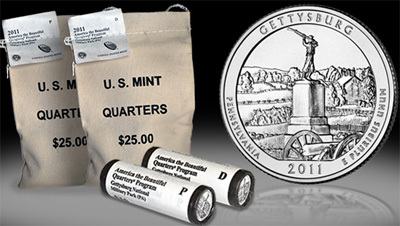 On January 27, 2011, the United States Mint began sales of numismatic bags and rolls containing the Gettysburg National Military Park Quarter. This represents the sixth overall release of the America the Beautiful Quarters Program, which features a national park or site from each state, territory, and the District of Columbia. The obverse of the Gettysburg Quarter features the 1932 portrait of George Washington by John Flanagan. This design is used in common for the entire program. The reverse image depicts the 72nd Pennsylvania Infantry Monument, located on the battle line of the Union Army at Cemetery Ridge. Inscriptions include “Gettysburg”, “Pennsylvania”, “2011”, and “E Pluribus Unum”. The United States Mint offers bags and rolls of the new quarters minted on the main production floors of the Philadelphia or Denver Mints. The product packaging indicates the name of the site, the state location, year of issue, and mint mark. The 100-coin bags from either mint are priced at $49.95 each, and the two roll sets, including one 40-coin roll from each mint, are priced at $39.95 each. Prices have been increased from the levels of the prior year, when 100-coin bags were $35.95 and two roll sets were $32.95. Numismatic bags and rolls for each release in the America the Beautiful Quarters series are scheduled to remain on sale for one year after the original release date. The 2010 quarters featuring Hot Springs National Park, Yellowstone National Park, Yosemite National Park, Grand Canyon National Park, and Mount Hood National Forest all remain available for sale on the US Mint’s website. what the hell you want.